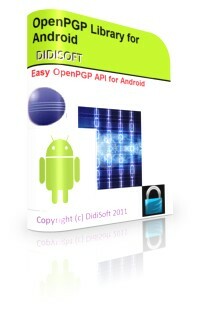 OpenPGP Library for Android is a class library that will save you time utilizing OpenPGP cryptography in your Android applications. The library provides the same set of functions and classes as our OpenPGP Library for Java, but has been rebuilt and updated for Android development. The encrypted files created with the library can be decrypted with the major OpenPGP RFC 4880 compatible software and the library can decrypt files created by such standard compatible software like PGP (r) 2.x up till the most recent PGP (r) 10.x and GnuPG. The library can be redistributed royalty free with your applications.